Kemper Gallery, Kansas City Art Institute, Missouri, Peter Voulkos Ceramics, 14 January-1 February 1975. Traveled to Helen Drutt Gallery, Philadelphia. 22 February-22 March, 1975. Braunstein Quay Gallery, New York, Sam Tchakalian/Peter Voulkos. 28 October-29 November 1975. The Detroit Institute of Arts. 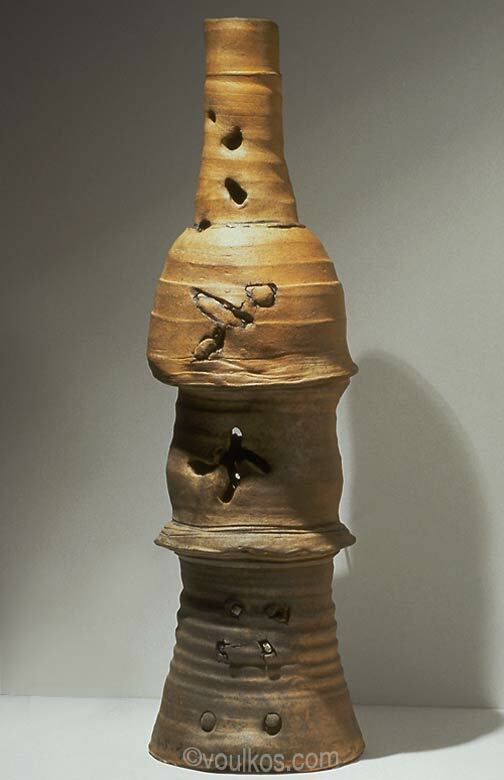 Selected Works by Peter Voulkos (in conjunction with 1976 Michigan Crafts Exhibition). 14 January-7 March 1976. Catalogue. Exhibit A, Evanston, Illinois, Peter Voulkos: Clay Drawings and Vessels, 29 February-25 March 1976. Illustrated on postcard produced for the exhibition. Museum of Contemporary Art, Chicago, American Crafts 76: An Aesthetic View, 26 June-5 September 1976, Catalogue. Evanston Art Center, Evanston, Illinois, The Ceramic Vessel as Metaphor, 16 October-20 November 1977, Catalogue, ill. The Oakland Museum of California. The Art of Peter Voulkos, 22 July-12 November 1995. Traveled to the Newport Harbor Art Museum, Newport Beach, California and the American Craft Museum, New York. Book, ill. p. 84, plate 42. Kaneko, Jun. Reflections on the Voulkos Retrospective, Craft Horizons, February, 1979, ill. p. 32. © 1997-2019 Voulkos & Co. All rights reserved.